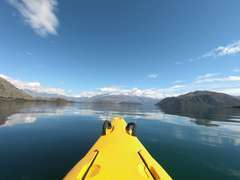 After two big walks in two days our legs were feeling very tired, so we decided to give them a rest and do some kayaking. 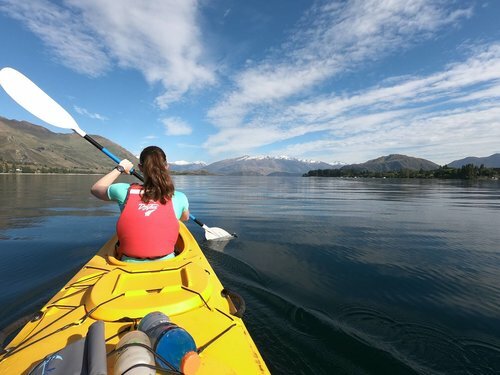 We hired a double kayak and set off on a very peaceful and stunning day on Lake Wanaka. We paddled up the edge of the lake and then cut across to Ruby Island. 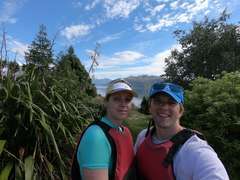 We did a full circuit of the island and then landed on a beach and had a look around and walked to the top of the island. We then paddled across to the other side of the lake and back to the start, throwing in a fast 500m along the way. After kayaking we met Chris and Martha for a nice lunch in Wanaka - they were travelling from Christchurch to Queenstown, the opposite direction to us. 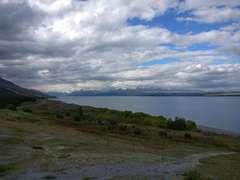 Following lunch we set off on the drive to Mount Cook. The weather was starting to get very cloudy as we drove alongside Lake Pukaki, up the valley towards the Glentanner Holiday Park.